Great replacement zipper for a Motorcycle Jacket! 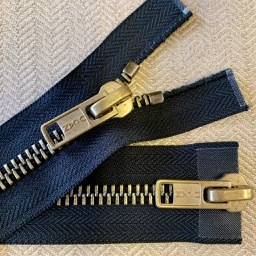 2-way separating or open bottom zipper. Antique Brass Metal teeth on Black tape. #8 or 8mm across the metal teeth. A standard METAL ZIPPER is a #5 or 5mm across the closed teeth. This is just a bit stronger & easier to use with your gloves on. I stock this same zipper in a #10 or 10mm (about 3/8") across the closed teeth. #5 - hoodie, light weight or dressy leather jacket. #8 - motorcycle jacket or medium weight leather. #10 - Carhardt's jacket or heavy leather. #15 - Make a statement. #15 isn't much stronger than a #10 but is wider by 1/8". All SEPARATING zippers are easily shortened from the TOP! Just order 2 top stops. Top stops stop the pull at the top of the zipper. Videos above to help you shorten any zipper.